If you haven’t noticed yet, you will soon discover that we are huge fans of coffee. Huge! We don’t like the price tag that comes with going out for gourmet coffee, so we often make our own. Okay, we also love the fact that we can make our own lattes and cappuccinos and sit drinking them in our pjs under warm blankets. It’s Minnesota winter, after all! While we usually have straight, plain coffee, we sometimes enjoy going fancy. Because we can. And it’s cheap (’cause it’s at home!!!). 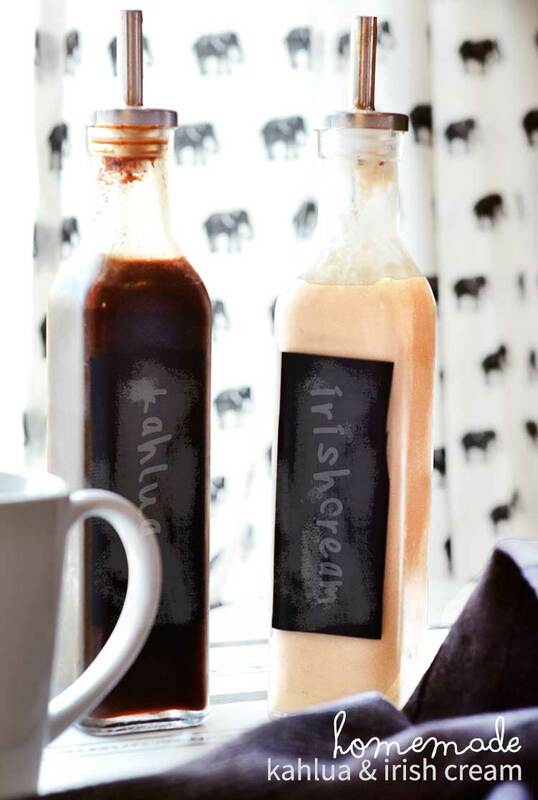 Some mornings we take out our homemade coffee syrups and add a dollop of whipped cream for a little splurge. Some rougher mornings have us pulling out the stovetop espresso maker and the frothing wand to go all out with lattes or flat whites or something like that. And some mornings require something more. Don’t pretend you don’t have those days too!!! And even if you are someone who would never drink alcohol before dinner, you’ll find these homemade recipes are a great addition to your after-dinner dessert and coffee. 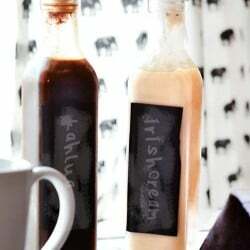 These homemade Kahlua and Irish Cream recipes are great because they make use of the alcohol you already have on hand, so you don’t have to have one more large bottle cluttering up your fridge (and costing you a pretty penny!). You can make a small batch of your favorite of the two, so you have just enough for a shot occasionally in your favorite brand of Joe. These recipes make just a bit more than our 12 ounce containers could hold. Mix everything, minus the whiskey, together in a blender until smooth. Store in an airtight container for up to 1 month in the fridge. This recipe makes a fairly large batch. We made a half batch and it was just a bit too much for our 12 ounce bottle. In a large pot over medium heat, combine the water, sugar, chocolate and coffee crystals. Take off heat and let cool to room temperature (about 15 minutes). Add the vodka and vanilla and stir well. Pour into airtight bottles and keep refrigerated up to one month.